There is no game this weekend that has more on the line than this one -- the winner wins the division, and the loser hits the golf course. The winner of the game will have another distinction, and this one is pretty dubious -- they will be the most pathetic division winner in recent and not-so-recent memory. Either the 7-9 Seahawks or the 8-8 Rams will be hosting a playoff game in just over a week. Anyone who would argue that the division winners don’t deserve an automatic home game will have a whole lot of ammunition thanks to this mess. Ugly. The biggest question mark in this one will be who takes snaps for the Hawks. Matt Hasselbeck is dealing with a hip injury, and Coach Pete Carroll has ruled him out. That means that Charlie Whitehurst would make his second career start in this game. Hasselbeck insists that he will play, though -- even though Carroll says such a return would be miraculous. It’s hard to know if it’s just gamesmanship ahead of a big game or if things are as bad as they sound for Hasselbeck. Fans will certainly be hoping for Hasselbeck -- he hasn’t been great this year, but Whitehurst’s only other start was a 41-7 loss to the Giants. Charlie’s not necessarily the guy you want to follow into a battle this important. While Seattle’s QB situation is murky, St. Louis’ certainly isn’t. Sam Bradford was expected to be good when he was drafted, but given the tools he had to work with what he has accomplished he has annihilated all expectations. He has already set an NFL record for completed passes by a rookie, and will likely break the attempts record in this game. He has already helped the Rams score 283 points -- a remarkable improvement from 175 all of last year. He passed for 289 yards and two touchdowns last time these teams met to break a 10-game losing streak for the Rams to the Seahawks. Now he’ll have to be sharp again to end a six-game losing streak in Seattle. I don’t mean to dwell on it, but this game is really ridiculous. The Seahawks have a chance to be the first division winner with a losing record ever. They have won just twice in their last nine, yet they have a chance to go to the playoffs. The Rams are coming off a 1-15 season, and though they are dramatically improved even the most sympathetic fan can’t really suggest that they are ready to be a playoff team. They would be just the third 8-8 division winner in league history. It’s remarkable -- and not in a good way. The Rams opened as one-point favorites, according to the NFL point spreads, and the gap has expanded to as wide as three points -- thanks largely to the issues at QB for the Seahawks. Three quarters of all bets placed have been on the Rams so far, so it’s possible that the line could keep moving beyond the key number of three and create a middling opportunity. The total opened at 43 and is shown stability at that level with slight downward pressure to as low as 41.5 in some places. 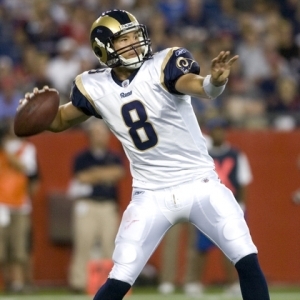 The Rams are an impressive 6-0 ATS against teams with a losing record. They are 4-0 ATS in their last four as road favorites, and 4-1 ATS in their last five road games. They are traditionally a very strong closing team -- they are 7-3 ATS in their 10 games in week 17. The Seahawks are 1-4 ATS in their last five games vs. the NFC, 0-5 ATS in their last five as underdogs, and 1-5 ATS in their last six overall. They are 5-2 ATS in their last seven against the NFC West. The ‘under’ is 10-3-1 in St. Louis’ last 14 against the NFC West, and 6-2 in their last eight games as favorite. The Seahawks have gone ‘over ‘in each of their last eight games, including their last four at home. The favorite is 6-1 ATS in the last seven meetings between these two. The Seahawks have been favored in each case. I frankly don’t see a lot of mystery surrounding this one. The Rams are a better team right now. They are better coached. They are younger and faster. They have a better quarterback. They are much, much hungrier. They played well the last time the teams met. I would hesitate slightly if the game went higher than the key number of three, but where it sits now I am happy to back the Rams. Indian Cowboy is on a 27-13 football picks run and he is looking at a huge weekend for college football and NFL handicapping. Normally IC releases three picks per week, but he really loves the lines this week and will have more than five picks. This is a great week to get in on his one-day package for just $49.